The spirit and support that we’ve seen in Ottawa is beyond incredible, we can’t wait to come back and rock Art’s Court on a Saturday night! 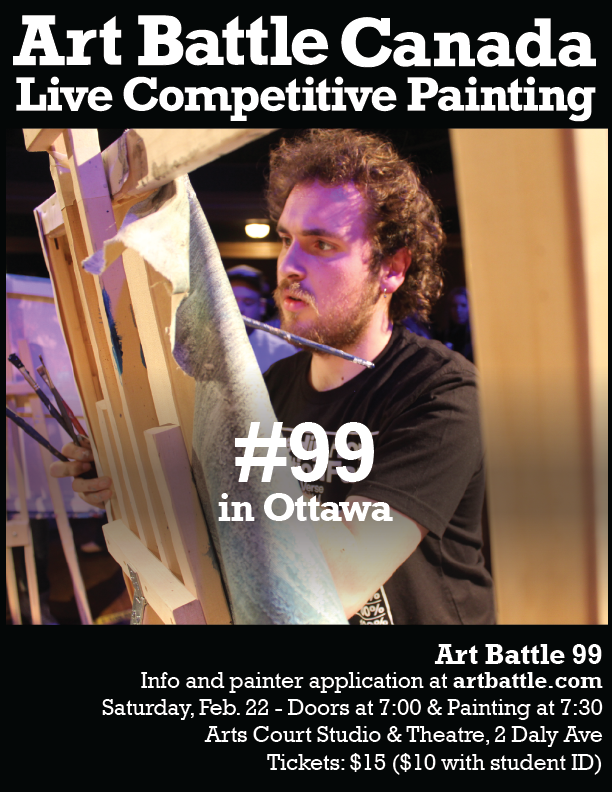 Join us and 12 of Ottawa’s best emerging and established artists on Saturday February 22nd in Art Battle 99 for an amazing night of creativity, canvas and competition! 12 professional and emerging painters will compete to become the next Art Battle champion, the winner earning a cash prize and a spot in the Ottawa Championship in June 2014. The winner of the Ottawa Final will compete in the 2014 National Championship. Our promotional partners, the AOE Arts Council (AOE) have been serving the Ottawa arts community for 25 years. As a not-for-profit charitable organization, AOE acknowledges the generosity of its donors, funders and partners who assist the Council in promoting, supporting and developing the arts in city. AOE represents a bilingual membership of over 450 artists, organizations and supporters. Visit www.artsoe.ca to learn more.